CLICK on the pictures below for SCREENSHOTS from the sales force software! New sales opportunities are very important for every company and information about winning / losing one are crucial. Every user can easily add new opportunities in the application, based on the daily activity. 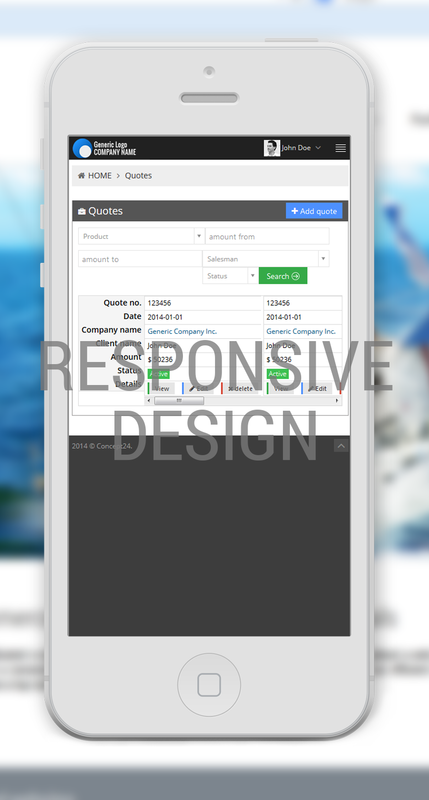 If you have lead capturing forms inside your websites, we can automatically integrate them inside the applications. 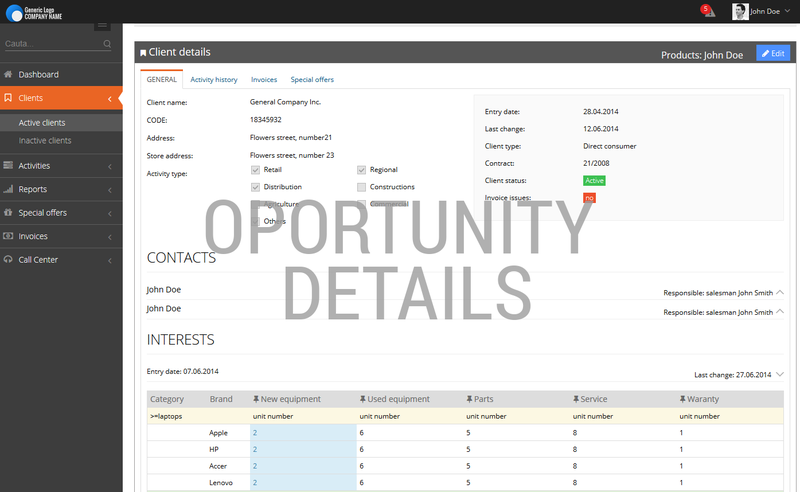 All the information related with the opportunity (emails, offers, tasks, notes, clients interests, phone discussions, attachments) can be integrated inside the application. All of them in one place! Each user can easily identify the stage of an opportunity and what are the following actions for that opportunity to be transformed into a sale. No worry if a sales agent is no longer inside your team: your can easily allocate an opportunity to another one having the entire activity’s history available. The pipeline of sales will be automatically calculated, up-to-date with the current status of opportunities, offers sent, offers accepted etc. You will only need one click to know the overall status of the sales, from a specific client or employee to the whole sales activity in your company. A perfect tool for planning and overseeing the overall company’s activity. 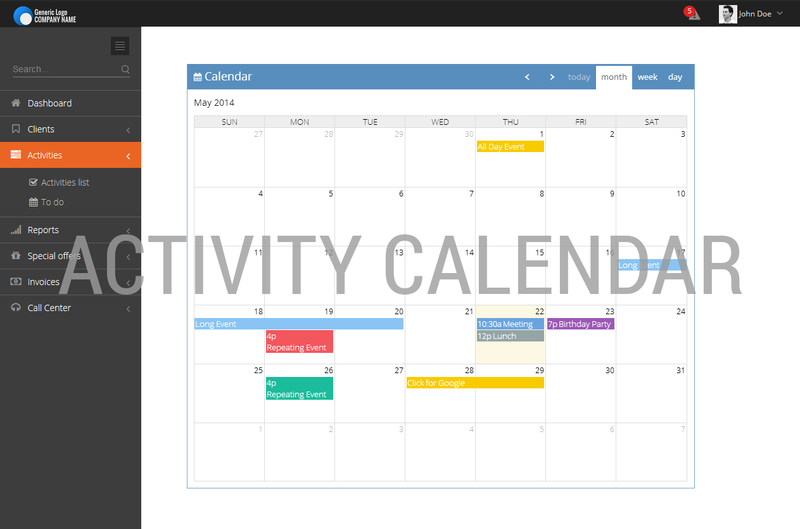 Each user will be able to easily add new activities (tasks, meetings, conference attendance etc.) either by using a form or just clicking on the desired hour and date in the calendar. 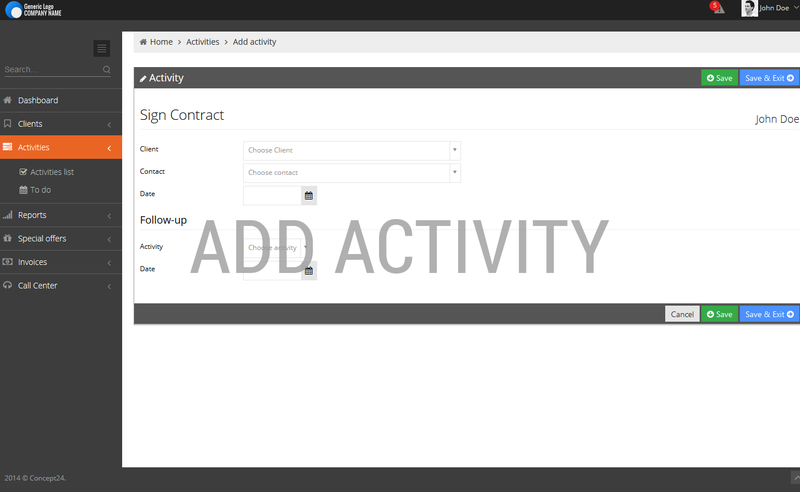 We can build the activity management process exactly as you need it, with the particularities inside your company. For each user will be very easy to be up to date with the activities that are to be done. Simple or more advanced filters can let the user know what meetings has set in the next period of time, what offers must be sent, what offers must be followed-up. Users are notified in the application and by email before and after the activity's due date, so they won’t miss any important to do’s. 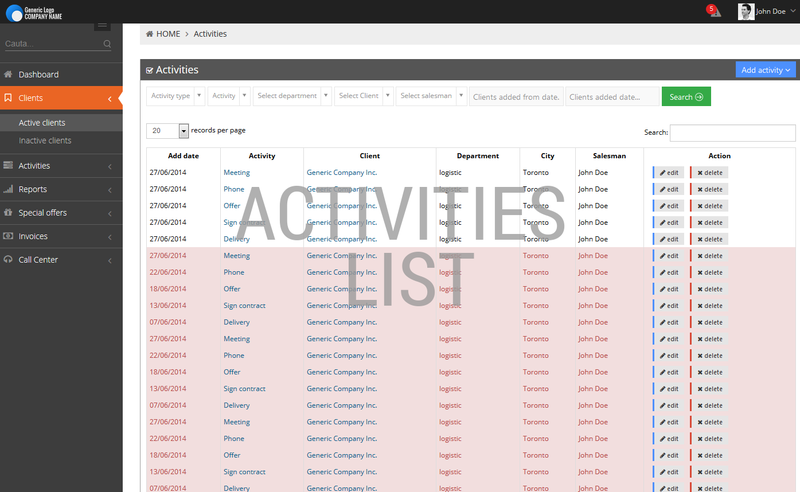 The management and users can run activity reports on specific criteria or even automatically, based on the preferences set on the application. Don't hesitate to contact us for a free evaluation. Send us a brief description of your project and we will get back to you with a tailor made solution (web based software) and a budget estimation.